Peabody Estates, one of London’s largest housing associations, undertook a £1 billion regeneration programme, which included a £750,000 refurbishment of sixteen tower blocks on the Thamesmead estate in South London. The high rise buildings were all constructed in the late 1960s and required upgraded fire protection and means of escape for occupants. The improved fire safety strategy was achieved in part by replacing the fire doors and glazed screens at each landing level – for which Soundcraft were chosen for their services. 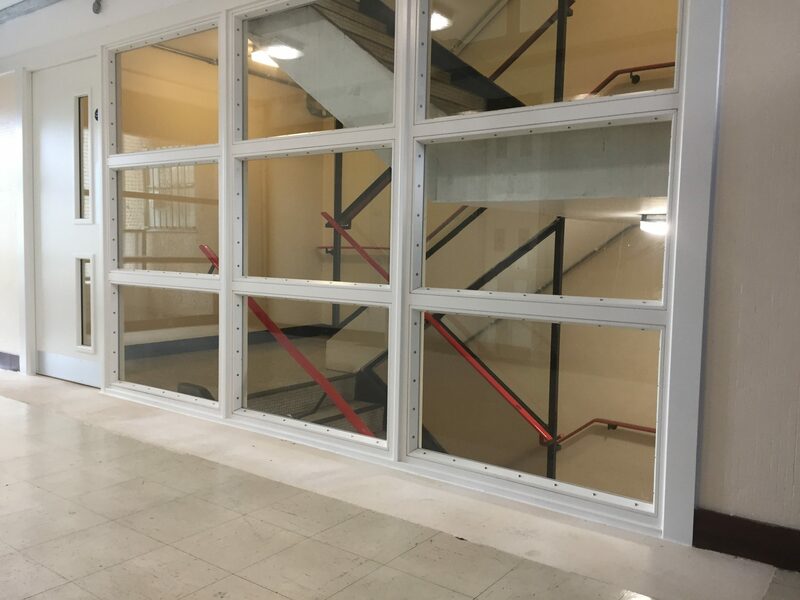 The refurbishment works took place throughout 2017 and required the removal of existing fire-rated doors and glazed screens at the access to the common staircase on each floor. Soundcraft Doors were involved from the outset, supplying FD60 timber doorsets and glazed screens in their place. Across the sixteen tower blocks a total of 208 doorsets were used, while the nine-panel screens accompanying each doorset were made up from 624 separate screens. All of the fire doors were pre-hung; factory fitting within the frames, and delivery to site as ‘doorsets’, reduced installation time and ensured consistency throughout. Consistency of design, manufacture and installation is critical to fire door performance. 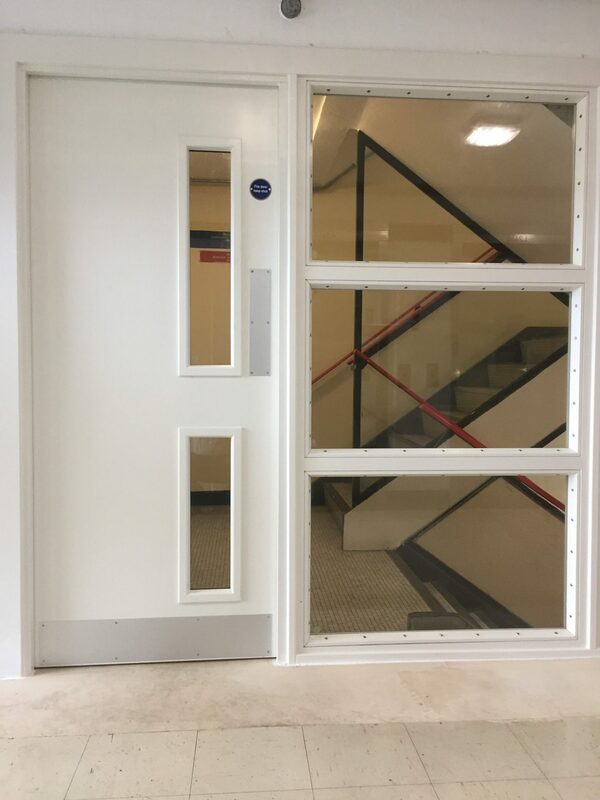 An FD60 rating means a fire door or screen provides, with its surrounding construction, one hour’s resistance to the spread of fire as part of the overall fire safety strategy. For greater peace of mind, Soundcraft fire doors and doorsets benefit from third-party certification under the Exova BM TRADA Q-Mark scheme. As well as factory pre-hanging, the doorsets were also supplied factory finished to the specified RAL 9010 colour code (pure white). Like supplying the doors already hung, eliminating the need to decorate meant another process less on site, speeding up the programme of works generally and minimising disruption for the residents. With so many components to be used on site, a significant logistical challenge was the limited space available for storage. Soundcraft worked closely with P.R.B Services to stagger deliveries and make sure that doors and screens were only delivered to site when they were due to be installed. 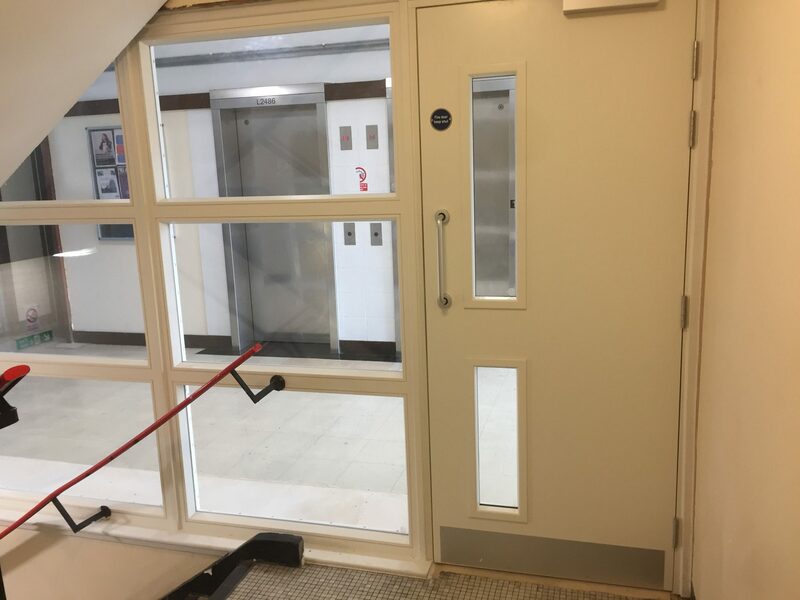 Fire doors supplied by Soundcraft are compliant with British Standards and supported by the Q-Mark fire door installation scheme. For more information on fire door testing and building regulation requirements, download our new ‘Guide to Fire Door Performance’ today.